​Join us and connect with like-minded colleagues while you relax and rejuvenate in the tranquil ashram atmosphere and experience the Ancient Yoga Center for yourself. Enjoy our delicious vegetarian meals, stroll and explore in the beautiful outdoors. ​The picturesque environment is ideal for retreats, trainings and workshops. 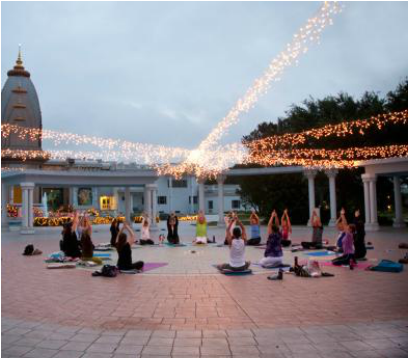 The Ancient Yoga Center is situated on the picturesque 230 acre property of​ Radha Madhav Dham, just 30 minutes south of down-town Austin, Texas. The rolling land, beautified by the meandering stream creates the perfect environment for exploring, walking along our many paths, self reflection and meditation.